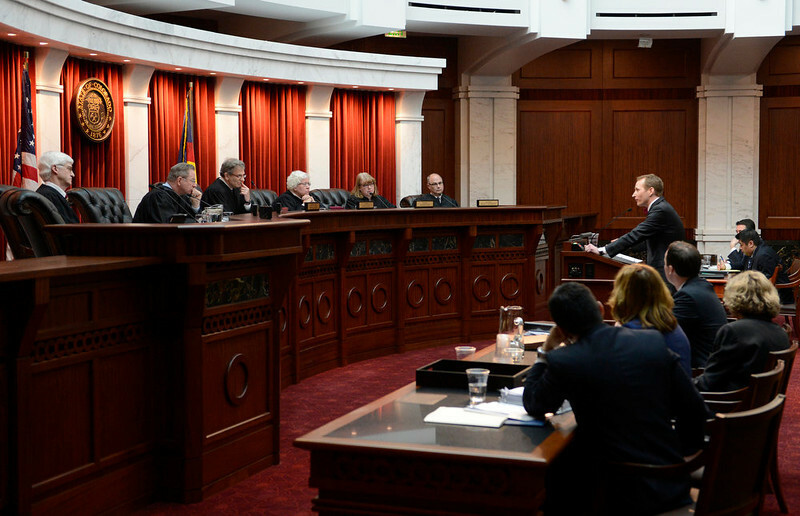 The Colorado Supreme Court heard oral arguments in the resurrected ‘Lobato v. Colorado‘ school funding lawsuit (previously termed the Super Bowl of school funding litigation). At issue: the constitutionality of Colorado’s system of statewide school funding. At stake: some $3B additional school funding annually (requested by the plaintiffs), along with an additional $17B in spending on capital construction – and, perhaps even more importantly, a looming constitutional crisis regarding separation of powers and the proper role of the courts in setting taxation and educational policy. According to the Joint Budget Committee Appropriations Report 2010-11 and the Colorado Attorney General (AG), K-12 in Colorado receives 45.6 percent of the general fund or $3.2 billion of a $6.97 billion general fund. The Colorado Constitution directs the General Assembly to “provide for the establishment and maintenance of a thorough and uniform system of free public schools throughout the state,” placing discretionary education questions in Colorado squarely and solely within the legislative ambit. (Lobato v. State of Colorado, dissenting opinion. Emphasis added). One of the plaintiffs’ main arguments is that the Taxpayer Bill of Rights (TABOR) must give way to the education clause so that taxes could be raised and revenues increased to meet the needs of the education clause without a vote of the people. This educational-funding lawsuit (seeking to force even higher state educational spending by court order) represents yet another abuse of the courts for the pursuit of political ends – unfortunately aided and abetted by an all-too-complicit (and highly political) majority on the Colorado Supreme Court, which previously (October 2009) overturned two lower courts which had (appropriately) dismissed the case (Lobato v. Colorado) as non-justiciable (i.e., a policy issue not to be decided by the courts). Interestingly, two of the ‘unjust justices’ constituting the majority opinion in October 2009 (Mullarkey and Martinez) are no longer on the state’s highest court, while the 3 opponents of the original ruling remain. Of the two replacements, one (Marquez) has (appropriately) recused herself from the case, as she had taken part in earlier decisions while representing the state as an assistant attorney general, leaving the balance of power in deciding the case to recently appointed Justice Brian Boatright. Note that both Justice Boatright and Justice Marquez are subject to a retention vote in 2014. If the courts are able to decide “the future of public education” by judicial fiat, Colorado citizens will have lost all control and accountability over our schools. The Attorney General’s office has also compiled a list of key pleadings and court decisions in the Lobato case. Cases such as Lobato – particularly Rappaport’s biased ruling – highlight the importance of fair and impartial courts and of judges who exercise proper restraint (in accordance with the rule of law) in considering – let alone deciding – issues of policy more appropriate for the elected, representative branches of government. Our courts have an important – even vital – role to play in our society and system of government. This is not it.